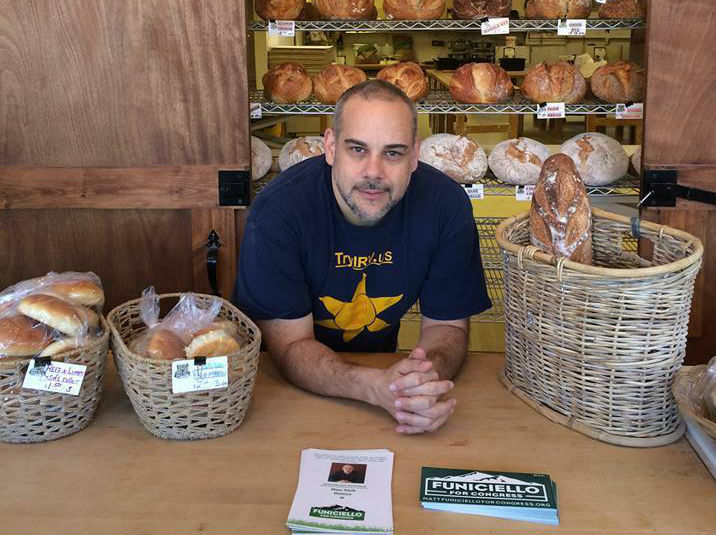 Ogdensburg, N.Y. – Green Party candidate Matt Funiciello was hard at work on election day – baking bread. The candidate for New York’s 21st congressional district has been a baker for 30 years and put in a few hours at his Glens Falls business before slipping off to vote himself. He then returned to continue with work. “I may be the only candidate in the county or even the country working at my job on election day,’’ Funiciello said. Funiciello is the only other party candidate running against Republican incumbent Elise Stefanik and Democrat hopeful Mike Derrick. Funiciello said both his opponents are “tourists” as “neither candidate really had ever lived here in their lives.” Funiciello was born and raised in Glens Falls, and spent most of his adult life in the district. The 49-year-old first ran for Congress during the 2014 midterms. Despite losing to Stefanik, who became the youngest woman elected to Congress at 30, Funiciello garnered 11 per cent of the entire vote, which he considered a Green Party success. Funiciello is the only Green Party candidate for Congress from upstate New York, even though his particular district has a full slate of Green Party candidates on the ballot, including Senate candidate Robin Laverne Wilson from New York City. Funiciello said climate change is probably the most important issue, “next to war and peace.” He said the response from the major parties to climate change has been insufficient. When asked about the presidential race between Donald Trump and Hillary Clinton, Funiciello says that given a choice, he’d take Trump. Funiciello will be watching the election results from his Rock Hill Bakery in Glens Falls. He said by this evening he’ll be ready for a good glass of wine, or two.